Above: George Mitchell and Dorothy O’Bannon address the school board during a contentious meeting. At one of the last school board meetings of the academic year, when administrators would normally be winding up the year’s business, emotions ran high. City parents and community leaders, still shaking off the effects of Baltimore’s recent riots and turmoil, unloaded on the school board, saying it is out of touch with the city’s low-income black community and fails to grasp how its decisions about student education impact the city’s future stability. As it happened, the first half of last night’s meeting was devoted to charter schools, a hot-button issue in the city and across the country. Representatives of five charter schools made presentations on their desire to open new charters in the city, expand those already operating or convert traditional public schools into new ones. After the presentations, the charter groups left, but their presence was felt in the room because of who else was giving testimony – a traditional “zoned” school, Langston Hughes Elementary, which is slated for closure at the end of the school year. The leader of the fight to save Langston Hughes pointed out that he had been contacted by a charter seeking the school’s building and made his displeasure known. George Mitchell, president of the Langston Hughes Community Action Association, told the board that he “did not have glitzy folders or presentations,” as some of the evening’s charter groups did. But he said the school, where he runs the after-school program, compared well to charters, had many similar offerings and highlighted the school’s comparatively high test scores. Schools CEO Gregory Thornton attempted to explain to Mitchell that the closure was not about the school’s performance, but he was cut off by another official. “There has been some talk of making Langston Hughes a charter,” Mitchell said, questioningly, to Thornton. Thornton shook his head no, but did not speak. Mitchell has been fighting the closure of Langston Hughes for months, but last night he came to the school board with a coalition of activists supporting him, including the Teachers Democracy Project, Baltimore Algebra Project and a number of community association leaders. Inte’a DeShields, Natalia Bacchus, Ben Dalby, Kailah Johnson and Twan Jordan hold signs protesting the closure of Langston Hughes Elementary. (Photo by Danielle Sweeney). 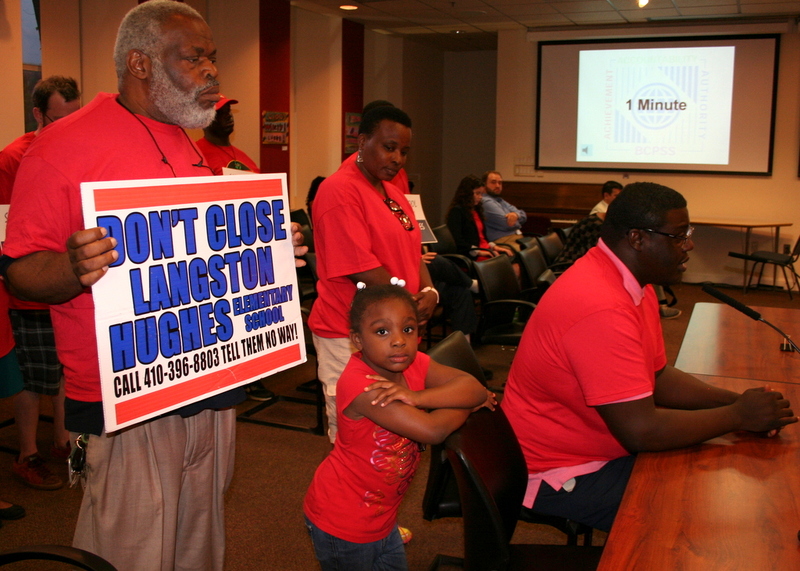 The school board voted to close Langston Hughes last December because of under enrollment. 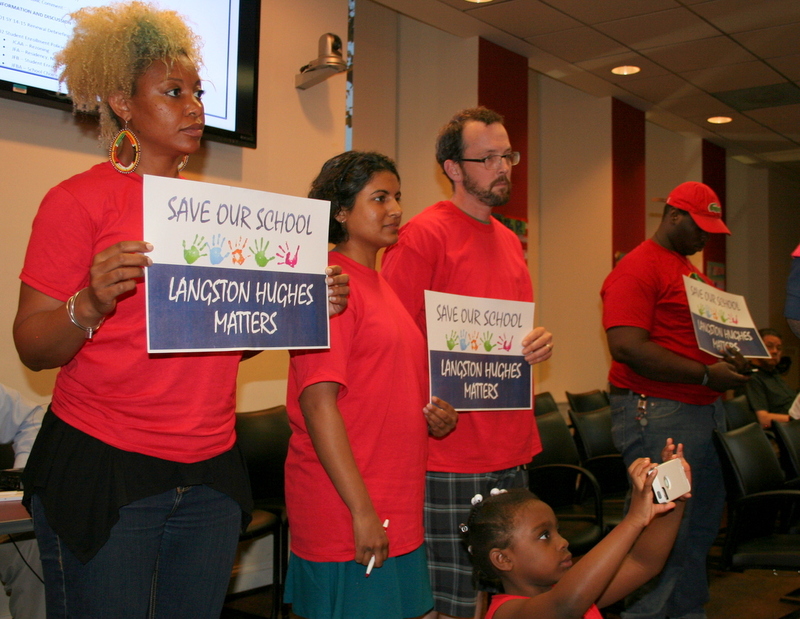 The Langston Hughes Community Action Association appealed the school board’s decision to the state board of education – a rare occurrence among schools marked for closure – and has a hearing scheduled in June. Mitchell wants the board to give the school time to get its numbers back up – an opportunity other small schools threatened with closure have been given. The enrollment decline began, he said, only after the school board decided to shut the school three years ago. Addressing the board last night, Mitchell expressed frustration about the charter group seeking the Langston Hughes building. The people behind the charter were apparently so unaware of what was going in the community, he said, they didn’t know the school was fighting the decision and even asked him for his support for the school building to be turned over to the charter operators. Emotions in the room continued to climb as long-simmering hostility toward the school board came to the surface. Youth advocate Kim Trueheart said there would be more uprisings in the city if the board didn’t stop “rubber stamping all the crap that is put in front of [them],” referring, in part, to charter school applications. 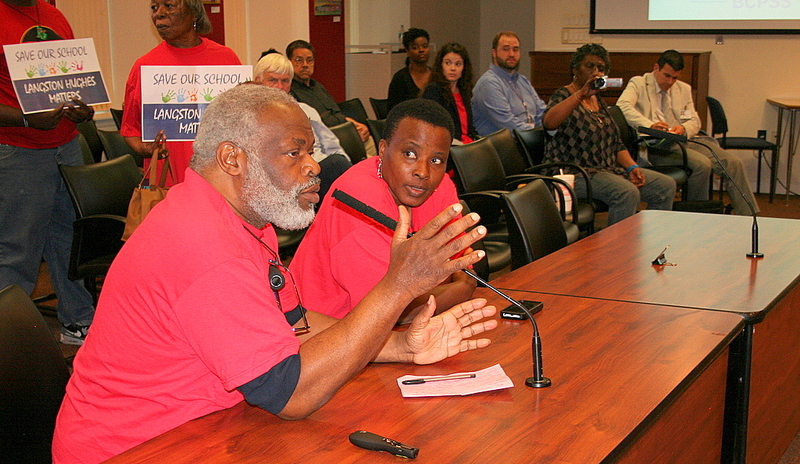 Jamal Jones, director of the Baltimore Algebra Project, a group of education activists, testified on behalf of Langston Hughes. But first Jones spoke in defense of Trueheart. He called her one of his O.G.s, hip hop slang for “original gangsters.” He said Trueheart spoke truthfully. Jones said that Langston Hughes’ problem was an issue of community control over the school and its resources. Several attendees unaffiliated with Langston Hughes testified about what they believe are the school system’s failings toward the African-American community, particularly black males and youth who need special education services. Some also connected these perceived failures to the city’s recent instability. One commenter, after reading the school board a bible passage about caring for the needy, handed each member a baloney sandwich – a symbol of what he thought of their decisions. Board President Sauls, who had maintained a steely composure throughout the meeting, appeared to be losing patience. But then she became emotional. Speaking with tears swelling in her eyes, she said that board members felt the impact of their decisions “in our bones” every day and were “offended” by negative comments about their commitment to city children. She grabbed a tissue and continued to dab her eyes through the rest of the meeting. At one point, Dorothy O’Bannon, a graduate of Langston Hughes, testified on behalf of the school. She suggested the school board go home and consider what Martin Luther King Jr. would have thought of the unrest and what he would have thought about closing Langston Hughes.